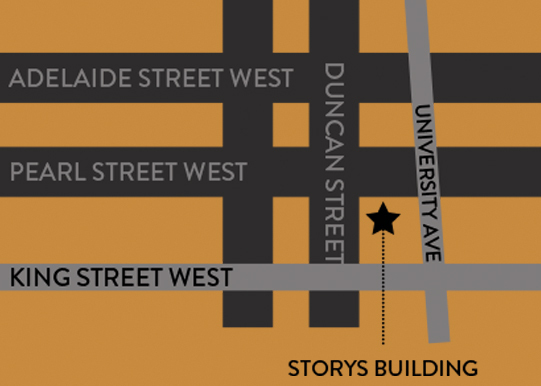 STORYS is located in the heart of downtown Toronto Entertainment District. Owned and operated by ICON Legacy Hospitality & INK Entertainment – the illustrious hospitality groups behind top dining destinations Patria, Byblos Toronto and Miami, Weslodge Toronto and Dubai – STORYS has held an abundance of top premiere parties, including for the Toronto International Film Festival. Using seasonal ingredients of the highest quality, we offer customizable menu choices, ranging from canapés and food stations to set menus fit for any occasion. Storys is here to ensure your event is one to remember. “Thank you so much for the perfect day to kick off our life together. We are both in awe of how quickly the year flew by! “THANK YOU SO SO MUCH TO YOU AND YOUR TEAM FOR SUCH A SUCCESSFUL EVENT. I know we threw a lot at your team but they handled every curve ball with such professionalism. The food was phenomenal! Please thank and compliment your chef for me. Every single one of your staff was so kind and we did not hear a single complaint from any one of our guests. (And believe me, we’ve had problems with staff before in other venues). Jenn and Barbara were just amazing and so were the security guys (they have SUCH great attitude), please thank them for me on my behalf. “A BIG thank you to you guys! Friday was absolutely amazing! We all had so much fun and the food and venue were being complimented to me throughout the night! The service was spectacular. People did not want to leave, hence our request to stay till 11 (thank you for accommodating this so last minute).